This book is a Wonder Starter Book. Illustrated original cloth cover with a Ford Torino? on the cover. 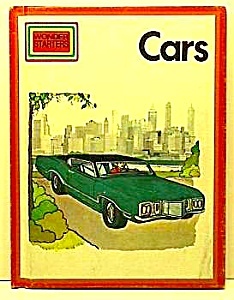 Discusses and illustrates cars from foreign countries and the U.S. Identifies parts of a car, how they are transported. Shows many models with proper names. VW Beetle is depicted on several pages. Stated First Edition/Library Edition. 6 1/2" x 8 1/8" and 24 pages. 1st and last page have 3/4" tear at the binding at the bottom from some careless fingers!